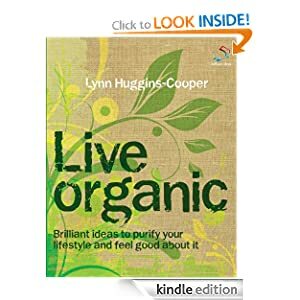 Get the Kindle Version of Live Organic (52 Brilliant Ideas) by Lynn Huggins-Cooper for FREE from Amazon. Going organic is the latest trend when it comes to food, and plenty of us have jumped at the chance to have more healthy eating options. Clothing has jumped on the organic bandwagon in recent months too, but aside from these two areas it's hard to see where else you can go from chemical to natural without having to spend hours researching organic products and then a fortune buying them. But it is possible to make your whole life organic without breaking the bank or giving up the little luxuries you love, and with the help of Live organic it's easier then ever to go natural. From organic cleaning solutions to chemical-free clothing, and from natural foods to fantastic organic flowers, Live organic has every aspect of organic living covered. Whether you're searching for the perfect organic food supplier, or looking to swap your chemical-packed cleanser with something all-natural, expert author Lynn Huggins Cooper can help you turn your lifestyle from chemical nightmare to organic dream. Simply brilliant.